What does this title mean? What’s with the recent bus obsession? Is this post even about buses, or are they just being carelessly shoehorned into every post title from here on out? Excellent questions, thanks for asking. Allow me to explain. In my last post I had some fun exploring a sample of the bus data from the excellent Transport for London Open Data initiative. I found that bus arrival times appear to be Poisson-distributed, and posited that they may come in clumps more often than you might expect (or hope). One week later I was the proud owner of 5GB of tantalising bus-based data. To reiterate the last post, for each time point I sampled I looked at all of the bus stops in Greater London and tallied up for each the time a person would need to wait for the first arrival of every type of bus at that stop. I then have a distribution of 25,000 or so bus waiting times, every 15 minutes for a 7 day period. Stealing a plot from the last post, the distribution of bus waiting times is approximately exponential, with most buses arriving soon, but some buses taking a long time to arrive. First lets see what this data actually looks like. We’re interested in how long we have to wait for a bus, so how does this vary during the working day? Plotted below are the median waiting times averaged across a working week, with 9am-5pm highlighted in grey. Wait times are a minimum in the morning rush hour, then stay low till around 7pm. They slowly increase in the evening, with a rapid jump after midnight. In London, this is when the schedules switch to the night time service. In the wee hours of the morning you should expect to wait around 10 minutes for a bus, but that’s as bad as it gets. Waiting times are very similar for all weekdays, especially in the evening. Now, what does this look like over the course of a week? Plotted below are the same data over the entire interval I was recording, with the weekend highlighted grey. Saturday is surprisingly similar to the rest of the week, though with a less pronounced minimum over the middle of the day. On Sunday we see the average wait for a bus is significantly higher than any other time of the week. Do these wait times arise from an exponential distribution, as was posited last time? Let’s plot the other parameters from the model. First , which represents how many buses will be arriving right now. Now this is a bit surprising. The total number of buses is much more uniform, though we can see little spikes during the morning and evening rush hours which are noticeably absent on the weekend. There is also a little dip in the evening – perhaps the drivers are having their tea? However a number of features are missing – there isn’t a drastically different number of buses on the weekend, and there isn’t the ‘knee’ we observe in the evenings. Given this surprise, how sure are we that the waiting times follow an exponential distribution? Here we do what every scientist does when asked a question: plot everything against everything else, and see what pops up. From above we expect that for the exponential model – what does this relationship look like for our data? The blue line indicates proportionality, and the greener the point the better the exponential fit. We see the ‘green’ points tend to lie on the model line as expected. However, there is a large spread of ‘red’ points lying off the curve, suggesting the existence of datasets where an exponential model is a poor fit. This mostly occurs when is largest, i.e. during the working day. 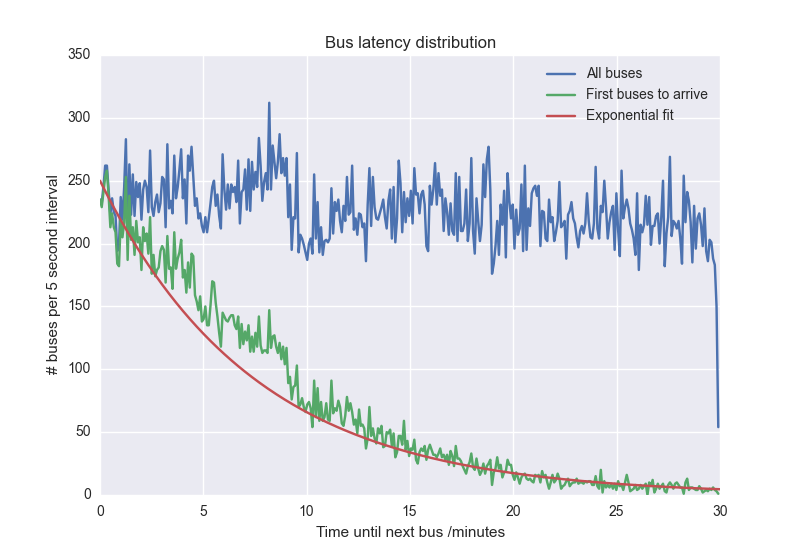 We expect an exponential distribution when the buses are most ‘random’, following a Poisson distribution. The data suggests that buses are then most ‘random’ for intermediary , on the transition between the day and night time schedules. Perhaps this makes sense – in the dead of the night there is little traffic and the buses can assume a regularly-spaced distribution. In the middle of the day there are so many buses that it is much more likely to have one arriving very soon, with few arriving later. In between there are just the right number of buses that they can get evenly spread across the city. We know now that we need to be careful in blindly stating that the buses are exponential, as an exponential distribution implies a ‘memoryless’ process, i.e. one which doesn’t depend on its history. This is fine for e.g. a radioactive nucleus, but less so for something as interlinked as a transport network. You can think of this as a ‘bus phase space’ which the system walks through each day, in a remarkably stable way from day to day. We start at midnight – zero on the plot. From here the number of buses rapidly decreases – moving to the left. However the average wait time doesn’t change hugely. In the small hours of the night we reach a minimum in the number of buses, with a sharp rise in the wait time. As the sun rises the number of buses rapidly increases, but the wait time is slow to respond, until approximately 6am when the wait rapidly decreases to a minimum near 8am. During the day the pattern is difficult to see, but in general there are lots of buses with a low wait time. Around the evening rush hour the number spikes, as does the wait time initially. After 6pm or so the wait time rises sharply, even though the number of buses isn’t changing much. You’ll notice there are a number of obvious loops in the plot, and this is a mark of hysteresis – the response of a system to an input depending upon the path we take to arrive at that input. In this case the system is the London bus network, the input is the number of buses being forced into this network, and the response is the average waiting time for a bus. If this system were linear we’d expect no loops, but a nice straight line: more buses = lower waiting time, and that’s would be the end of that. Of course the real world isn’t linear, and importantly doesn’t react instantaneously to an input. In this case it takes time to add or remove buses, and its obvious that the wait time will depend on history through the traffic which has built up previously in the network. This dependence on history indicates that the bus network does have memory, and therefore shouldn’t be described well by an exponential distribution. Curiously, an exponential distribution fits best over the course of the largest loop above, the most ‘hysteretic’ part of the phase space. Finally its worth noting that there are no new ideas in science, merely rediscoveries, so of course this idea of traffic hysteresis has been discussed in the literature (see below). Many authors see these loops in ‘speed-density’ phase space (see e.g. my post here) from real world measurements, and it is possible to reproduce them in analytical models of traffic flow.